Since becoming a parent in 2014 and again in 2015 my working out looks nothing like what it was prior to kids. From 2008 til 2014 I pretty much did whatever workout Beachbody released. This worked extremely well for me. Throw in some swimming, bike riding, snowboarding, and playing a lot of softball kept me in shape. I probably did 5 rounds of P90X, two rounds of Insanity, one round of Insanity Asylum, two rounds of Body Beast, and many hybrid programs along the way. But something hasn’t felt right these past couple of years since becoming a parent. The thought of doing another round of P90X or Insanity sounds exhausting. It’s not that I can’t do the workouts anymore. It’s that I can’t get my mind around doing them. The other day I read an article on MarksDailyApple on the topic of rest and recovery. Mark gives his opinion about an article he linked to talking about how the High Intensity Training Obsession Has Failed Us. The author, Joel Jamieson, talks about how when he was in college he did a workout routine the Bulgarian Olympic Weightlifters did in the 1980s. The program revolved around 2-3 short, high intensity workouts per day, six days a week. Joel did this for 12 weeks and got very strong. Six years later Joel was in his mid twenties running his own gym, working 60+ hours a week, and training other people so much that his fitness slipped. To get back into shape he decided to do the Bulgarian weightlifting program again. It worked before so it must work again. Turns out that was not the case and the program crushed him. His joints started hurting and halfway through he became sick of lifting weights all together. Joel goes on to talk about how the “Intensity Mindset” does not work in the long run. Basically, “if you’re not seeing results than it’s because you’re not working out hard enough” is wrong. He finishes the article talking about how everything comes back to energy. And that the brain controls where the energy flows. With fitness being the last place where the brain will allow energy to flow. We can push and push til we end up in what Joel calls “Recovery Debt.” You have pushed your body so far past the point of recovery that injuries start to pile up and the results do not follow because the body needs to recover to grow. Essentially, each of us only has so much energy. Just because you’re working out doesn’t mean you are creating more energy. What he’s saying is the non stop working out you’re doing is taking energy from other places where you need it. 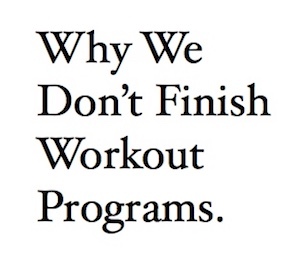 This was exactly how I was starting to feel about workout programs in 2012. When I read him use “Recovery Debt” the “rearranging deck chairs on the Titanic” phrase popped into my mind. Along with when I hear people or Governments talk about refinancing debt and being happy about it even though there is no money coming in to pay it off. Eventually, all debts must be paid. I started thinking about being 25 years old working as a mortgage banker and how getting to the gym 3 days a week before 7am was all I had energy for. Then how after I was let go and started figuring out internet marketing and working for myself that my energy levels increased. Even though I was working more I did not have the stresses of everything involved with that job. The commute, hitting the goals the company wanted for me, being asked to come in on weekends on Friday, and so on. Without those stresses I had energy to put towards my fitness. I crushed P90X the first, second, and third time I did it. And then I crushed Insanity followed by Insanity Asylum. The Beachbody Coach business I signed up for meshed in effortlessly with the other projects I was working on at the time. Energy levels were good. Stress was low. This is how it was for me from 2008 to 2014 (28 to 34 years old). But during that time period I started to develop injuries and its my opinion they were caused from doing intense workouts all the time. I was stuck in the “intensity mindset”. I kept pushing through when I needed to scale back. It wasn’t until I threw out my arm did the thought of cutting back to maybe one workout program a year instead of 4 cross my mind. One of us is tired. The other is exhausted. I remember communicating with customers of mine from Beachbody who were parents trying to do P90X. I’d say less than 10% made it through all 90 days. Same percentage goes for Insanity, Body Beast, and others. And after having kids, the thought of doing a round of P90X exhausts me. Not doing P90X. Thinking about doing P90X. I know how much energy is needed to get through one workout let alone six workouts a week. After reading the article it kind of makes sense. My brain is telling me it does not want to use the energy I have towards doing P90X again. At least right now. It’s telling me it knows I need a certain level of energy to take care of myself and to be a parent to my 2 and 3 year old. OMG – they can be so exhausting at times. If and only if I take care of myself, take care of the kids, and everything else will my brain allow energy for fitness. Not the other way around. Maybe this is why subconsciously I had been looking for a simpler workout plan (not a 90 day program) these past couple of years. When I found and started incorporating the simplicity of the Primal Blueprint workout 18 months ago along with one Beachbody program a year mixed in with something from Beachbody On Demand from time to time did I start to enjoy working out again. For years, the intensity mindset worked. It was just me. I had very little stress. All I had to do was take care of myself which was easy to do since I’m kind of simple. I had massive amounts of energy available to do intense workouts. Not so much anymore. Whats interesting is the timing of this article. Its January here in Michigan. Winter officially moved in the day after Christmas. Its been hovering around 18 degrees for three weeks. Winter and I do not get along that much anymore. It drains my energy. Throw in the fact I didn’t eat well over the holidays and put on weight. And then our 30 year old furnace started squealing last week. For the past couple of days I’ve been calling HVAC guys to come over and give me quotes on installing a new furnace, hot water tank, and a/c unit as those are 25 years old too. After they left I’ve been researching the different furnace brands trying to make sure I pick the right one. From what I can tell the three brands I’ve been proposed are basically the same. I wouldn’t say its been stressful but the thought of writing a check for $8500 is not a good one. But I had to address it. And it took up a lot of energy. Energy that I was not directing towards my fitness. While all of this is going on I can’t bring myself to get back to working out and I was doing so well up until Christmas three weeks ago. I had just finished three straight weeks of a hybrid workout I made up without missing a day. The weather, not eating well, and addressing potential house related issues drained the energy I’d otherwise be using towards working out. There was nothing left over so I haven’t done anything for three weeks. Before I would have pushed through. I’d get a little mad at myself when I’d miss a workout. Not anymore. I now know that workout is going to be a waste of time and its better to address those things acquiring more energy than normal first so I’ll have ample amounts to get back at my fitness when their completed. It’s refreshing to read an article like that. Its something I’ve been thinking about more often since becoming a parent. 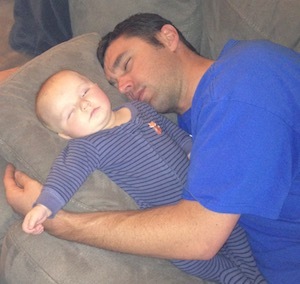 Those first six months of being a new parent were exhausting. Throw in the fact we found out we were pregnant again when our oldest was five months old. My health and fitness suffered immensely. Doing P90X or something similar was a no go so I’d do random workouts two days a week. Health and Fitness were important to me but I had this odd feeling all of my other things were getting in the way of me getting back to being healthy again. The kids now took up an immense amount of energy. My solution to get back energy was to go into a spree of selling or throwing away things. First to go was my 1992 Feature Mustang that mostly sat around which caused me stress because I’d always look to see if it was leaking oil. Then went 50+ things ranging from $10 to $100 that I sold on Craigslist. Every time one of them left my house it got me one step closer to getting back to working out. It’s as if I got back a little bit of energy every time I sold something. All of this freed up a lot of energy for having a new baby and a one year old. I found myself having energy to workout. Fast forward to my youngest being one and I rarely quit during a workout anymore. Its only when times like the past couple of weeks happen when things stack up on me where working out gets pushed aside. I now have a plan for when its time to replace the furnace. Eating is getting back to normal. And with those being addressed I’m ready to overlook how cold it is in my basement and push on with month two of my hybrid workout. All because my energy levels are getting back to where they need to be.